With all of the threads about loosening, dropping augers, and devices to prevent augers from falling out of drill chucks, has anyone made an adapter to replace the chuck completely? My electric auger drill is dedicated, so if I could get a more reliable connection by eliminating the keyless chuck, I would. The ice fishing seasons have been tough on the chuck anyway- the metal surfaces are getting rusty from all the snow and rain. I bet many would pull the chuck for the winter, and replace it for summer use. Anyone seen this for sale, or designed by a handy member? 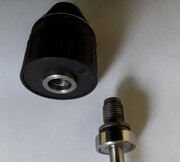 The adapter would have to be threaded with the same pitch/size threads as the chuck. Most chucks then also have a screw down at the bottom that screws into the drill shaft, so your adapter would also need to have a way to do the same to prevent it from coming unscrewed. The only way to loose your auger with a clam plate is for the bolt to break !! The Gen 1 Clam Plate w/required chuck removal had a screw in attachment which also used the reverse threaded screw from the drill .. I guess you could use it on its own w/o the plate to accomplish what you want. My direct connect Milwaukee Fuel with Ardisam Quick Connect. Sweet. I suppose you could try to glue or solder it in place so that it never comes loose, but that's not the route that I would take....as I use the drill year round. That's a big advantage over something like an Ion that you only use in winter. I've been using a cordless drill + auger for many years now.....way before they became popular.....not meant to brag.....but because I was early, I made almost all the mistakes you can make with them while figuring out what works for me including: losing the bottom half of my auger, throwing bolts, burning up drills, breaking guards, etc. Best solution for me is a metal disc (not plastic) slightly larger than the hole to prevent losing the auger. I find bungee retainers create extra resistance which reduces battery life slightly - although batteries are so good now it almost doesn't matter. The plastic discs break - those are no good. The metal ones can be sharp when spinning so wear gloves, but they absolutely don't fail! Drill that I use is a Milwaukee brushless 18V fuel. Very powerful (careful with your wrist), great batteries. Some guys like Rigid for the warranty. The new DeWalt drills are good, too. You don't want an under-powered drill as it will burn up under the strain over time. Save the light drills for home projects. Whatever drill you choose, the chuck can loosen over time. I just make sure it's tight between holes or after several holes. After a while, it becomes 2nd nature. Last tip is to use a few wraps of electrical tape over the wing bolt to keep it from flying off during use. So, 3 things to remember....metal disc, drill, + tape. I hope I saved you about 10 yrs off the learning curve! I wish I could tell my younger self the same advice. same for me. i am on my second one. first one still works, but the holes for the auger bolt are getting egg shaped and allowing the auger to be loose. took around 7 years to get that way drilling tons of holes on a 6 inch lazer. i like that i can remove the drill from it in seconds and store them separate with out using the auger bolt every time. i remove the drill from it before coming home and put it together at the lake. i can use the drill for ice anchors or what i want to use it for on the fly. the bungee helps hold shopping bags off the drill and battery to keep water and snow out of it. lately i bring in the 8 inch lazer that i switched over to because of all the ice stuck on it and leave the drill and battery outside unless the battery needs a top charge. then the drill stays outside. it's a much smaller footprint and less weight than using the clam plate that i returned. it made using the drill to limited and was unnecessary. How does this attach? Does it have the same reverse thread as the chuck? Does it have a RH thread retaining screw? The chuck is a 9/16 - 18 fine RIGHT Hand thread. The retaining screw is left hand. Retaining screw on the Mud Mixer is also left hand. Most chucks are threaded left hand, and have a right hand screw that keeps them from loosening if you have to turn something backwards. I assume that red piece has the same setup? Incorrect. I have a 20v DeWalt, 18v DeWalt, Milwaukee fuel (above post), Mwlk brushed & older Black & decker cordless and 2 corded drills. All have right hand threads on the Chuck and left hand threads on retainer screw. Think about it, a drill primary rotation is clockwise drilling holes and inserting screws so right hand threads turning clockwise tighten. Righty Tighty, Lefty Loosey. DeWalt 18v Chuck & Drive shaft right hand threaded pic. You are right! My bad. I ordered this today. My chuck is getting rusty. Never lost the bit, but I don't have any kind of a retainer, and this looks to be secure. I read through this thread and I don't believe you stated what brand of drill you have. Just thought I would mention that if you have a Milwaukee Fuel, I don't think the adaptor you ordered will fit. The Fuel has a larger thread size that most 1/2" drill chucks. papadarv: I looked on the Ardisam website and could not see the quick connect you mentioned, do you know where I might look to find it? Thank you. I have an old Ridgid. I will post a picture if it fits. Two problems with that adapter in my opinion. One, it's Aluminum, and could strip pretty easily on the steel chuck shaft. Two, there's no security bolt, or any way to secure it, other than the threads. Could potentially come unscrewed and drop the auger off into the abyss. Sportsman Guide on-Line. Price gone up about $7 since last June. I never thought they would make one without a security bolt- guess they plan on never going backwards! I am hoping that this will be good enough for my 5 inch bit- will have to wait until the snow settles a bit before I can use it, that bit is too short for current conditions. Here is the link to Ardisam ION, maker of the quick release, price $44. Sportsman's Guide was a bit cheaper. So where does the red piece between the drill and the Ardisam come from? Did you make it? So the EBAY part attaches fine to my Ridgid drill. I would have liked to see a way to use the reverse thread retainer screw from the chuck, but without it I tried to run the auger full speed and stop suddenly, engaging the brake, and so far no loosening. I never had an issue with the chuck version either, but at least this one won't rust. It also seems to be a good length. The short adapter in the chuck was just a little short for me. It also was not long enough for late season ice. Going back to a 5 inch hole always seems like a luxury after using the 4.5 inch Nils. Looking forward to torture testing this combination when I get back on the ice in a week or so. Also made one for my Mud Mixer along with a few adapters.